An activity trigger is a great way to trigger a macro based on a group of sensors. This enables you to monitor a bunch of sensors and just trigger based on the activity, or inactivity, of those sensors. For instance, let's assume that if none of your indoor motion sensors are tripped for a half hour that it's safe to assume that nobody is home. Granted, you need to have pretty good coverage of motion sensors before you can make that assumption. Perhaps you want to turn all the lights in the house off if nobody is at home. 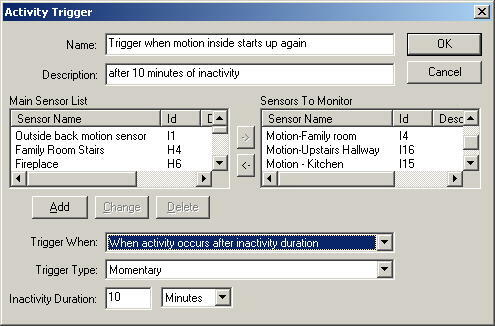 To set up this trigger, you would add all your indoor motion sensors to the "Sensors to Monitor" list, and then choose a Trigger When value of "Immediately after inactivity duration" and a Trigger Type of "Momentary". Then you would add a switching action to your macro to turn all lights off. Now lets say you want it to turn on the kitchen light when you first walk in the door, but not after that unless there's inactivity again. Now you would set up the same kind of trigger where it monitors your indoor sensors, but then you would set the Trigger When value to "When activity occurs after inactivity duration" and Trigger Type would be set to "Momentary". Name and Description - This should be a brief name that describes what the activity trigger is used for. It will display in the trigger list so it should uniquely identify the trigger. The description can be used for adding extra information about the trigger for your own benefit. Main Sensor List - The main sensor list shows all the sensors that you've already set up (maybe from the Sensors and Switches window). To put any of these items in the Sensors To Monitor list, click an item in the list, or hold the shift key and click on a second item to select a range, or hold the control key on the keyboard and click on items to select or deselect multiple items. Then click the right arrow button to put these items in the Sensors To Monitor list. This will not remove them from the Main Sensor List. Sensors To Monitor - To get items into this box, click the appropriate sensors in the Main Sensor List and then click the right arrow. To remove items from this list, select an item, or a group of items in the Sensors To Monitor list, and click the left arrow button. This will remove it from the Sensors to Monitor list. Add - If you haven't added a sensor that you want to monitor yet, you can click the add button. This will add it to your list of sensors. Change - If you want to change a sensor, you can click change to do so. Keep in mind though that this will change this sensor for everything that uses it. Delete - If a sensor is no longer in use and you want to delete it, you can do so by selecting the proper item in the Main Sensor List and clicking Delete. Be careful about deleting sensors however because this sensor will no longer be available anywhere after this. Trigger When - This essentially lets you monitor for activity or for inactivity. If it is set to trigger "Immediately after inactivity duration", then it will trigger right after there has been no motion from any of the sensors to monitor for the inactivity duration period. In other words, it will trigger as soon as none of the motion sensors haven't triggered in a while. If this is set to "When activity occurs after inactivity duration", then it will wait until there has been no motion from any of the sensors to monitor for the inactivity duration period, and then it will continue to wait until motion is detected again for any of those sensors. In other words, it will trigger once there has been inactivity, and activity has been resumed again. Trigger Type - If this is set to "Momentary", then it will trigger as described above for "Trigger When". If it is set to "Continuous", and Trigger When is set to "Immediately after inactivity duration", then once no monitored sensors are triggered for the inactivity duration, it will continuously trigger until activity is resumed again. If Trigger When is set to "When activity occurs after inactivity duration", then it will trigger continuously until the inactivity duration is met. It will not trigger while there is inactivity but will trigger again when activity resumes. A Trigger Type of Continuous is usually used in conjunction with other sensors so they only trigger a macro when there is activity or inactivity with the monitored sensors. For example, you could have your outdoor motion sensor turn on an inside light near that outside motion sensor when there is no indoor activity, in order to confuse a would be burglar. Inactivity Duration - This is the amount of time in which none of the monitored sensors are triggered before it is considered "inactivity". Keep in mind that it will not trigger until at least this amount of time. You can choose the unit type for the time period by clicking the down arrow portion of the control on the right.